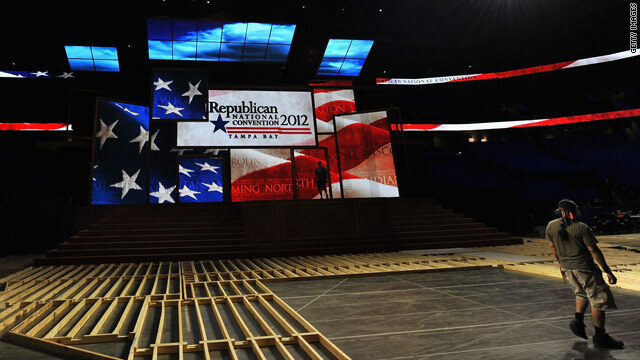 Tampa, Florida (CNN) - The Republican National Convention has cancelled the program's first day due to Tropical Storm Isaac, Republican National Committee Chairman Reince Priebus announced Saturday. "Due to the severe weather reports for the Tampa Bay area, the Republican National Convention will convene on Monday August 27th and immediately recess until Tuesday afternoon, August 28th," Priebus said. "After consulting with Governor Scott, NOAA and local emergency management officials, we are optimistic that we will begin an exciting, robust convention that will nominate the Romney-Ryan ticket." Vice President Joe Biden had announced plans to campaign in Tampa on Monday and elsewhere on Florida on Tuesday. On Friday evening, the Obama-Biden campaign cancelled his Monday events, and Saturday, the campaign announced cancellation of his Tuesday plans. GOP officials expect 50,000 people to attend the convention where Mitt Romney will officially accept his party's presidential nomination and make the final turn to the November election. The delay was brought about because Isaac is expected to be west of Tampa in the Gulf of Mexico early Monday morning – the first day of the weeklong event. Before the RNC announcement, Florida's Republican Governor Rick Scott announced that he was cancelling his activities at the convention but would remain in Tampa to monitor and coordinate the state's response to the storm. Wind gusts in Tampa were recorded at 30 mph on Saturday afternoon. As the convention and storm approached, RNC and government officials stressed their preparedness. "I declared a state of emergency for the state of Florida," Scott told reporters Saturday morning. "That's standard protocol to make sure we can coordinate our efforts with federal, state, and local so we can have the proper response." On CNN's "Starting Point" Thursday, RNC communications director Sean Spicer said the convention had "contingency plans to deal with weather-related and other circumstances that may occur to ensure that the business can go on at the RNC and Mitt Romney and Paul Ryan will become our nominees."